GUY is proud to announce Rebecca Alvarez, P.E., C.F.M. 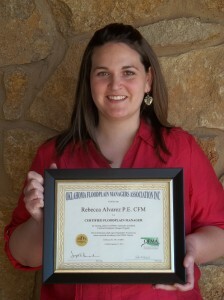 has successfully completed the Certified Floodplain Manager certification exam. This is a nationally accepted program that is designed to recognize the knowledge and technical skills of the nation’s floodplain managers. Ms. Alvarez is now a member of the Oklahoma Floodplain Managers Association, Inc. She is a graduate of Oklahoma State University in Stillwater.